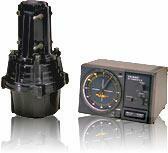 This new, high-performance rotator is ideal for heavy-duty applications. Its slim-line constructions is ideal for many crank-up tower installations. Rotation range: 450°, with presets.